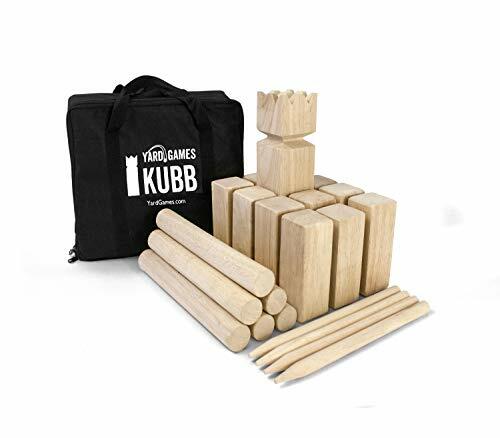 If you want to enhance your summer vacation or camping days with a fun backyard game, Kubb could be a great choice for kids and adults alike. To play it in style, you’ll need the best kubb set though. There are plenty to choose from on the market, but we’ve selected for you the absolute best. Check them out below. 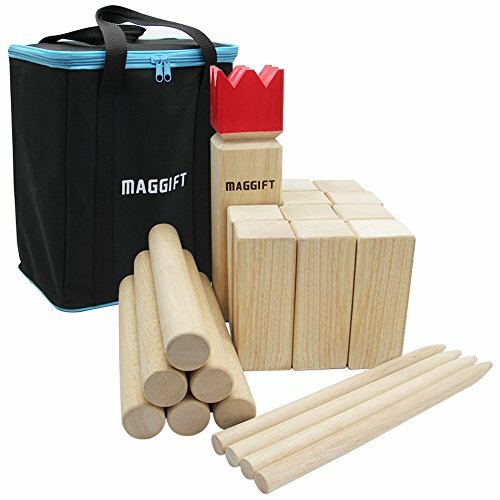 The MAGGIFT Kubb Game Set is our favorite for more than one reason, but the main is because you can use it both indoors and outdoors. It comes with components made from rubber wood, a resistant yet rather soft material. Coming stylishly packed in a carry bag, the game presents flawless aesthetics. Each piece is carefully crafted to present no dentures. Smooth edges and quality finishes make this kubb set for amateurs look professional. If you’re new to kubb, but the game idea excites you, know that this set also comprises a set of instructions alongside most pieces you’ll need throughout the game. The king, kubb blocks, and tossing batons respect the tournament sizes. You will even get the corners pegs, and the only thing missing is the mid-line stakes. Nevertheless, this game still brings outstanding quality for the money and is guaranteed to satisfy all your backyard fun needs. 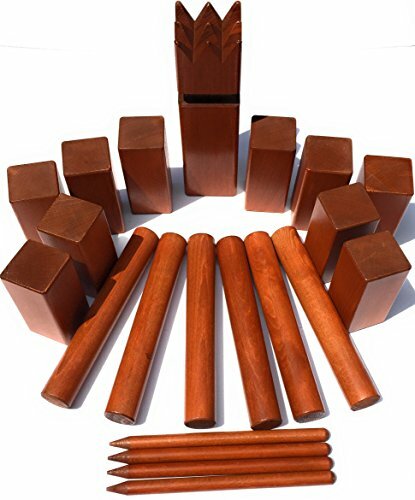 Whether it’s a barbecue party, a gathering or a trip, this premium kubb game set by Yard Games can deliver loads of fun. It’s beautifully crafted in eco-friendly hardwood, an inspired choice of materials that ensures durability. Despite being shock-absorbent though, the components won’t withstand multiple shocks on hard surfaces. You can play on grass, ground, and sand, but it’s recommended to avoid setting up a kubb game on an alley, patio, or deck. All components have a classic design that maintains the natural color of the wood. Although it may seem simplistic, this set is a great choice if you want to customize it with your preferred colors or logo. We also like that everything comes packed in a stylish zip-up tote that is more compact than expected. It will not only fit into your luggage, but it’s also easy to carry and gives you a perfect storage place for your pieces. Considering that it comes at an excellent price and packs true quality, this is undoubtedly a great alternative to our top pick. 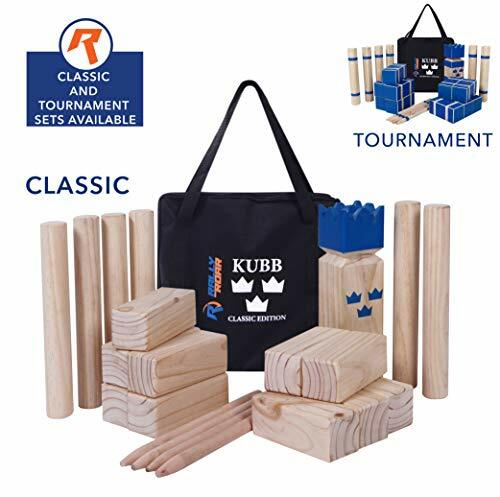 If you want to play by the rules and settle for nothing less than the best, this kubb game set from Kubbspel Classic will surely cater to all your needs. Its components respect the official US tournament regulation size so that you can play by the rule. Everything in this set is exceptional, from the superior craftsmanship to the quality of the wood. Manufactured in Italy from eco-friendly solid Austrian hardwood, this is one of the most environmentally-friendly kubb sets. You can expect to pay for such quality though. This game is by far the most expensive on our list. Nevertheless, it will make you look like a pro on the green. It not only complies with all tournament regulations regarding weight and size, but it also looks beautiful. Besides enhancing aesthetics, the dark stain lacquer finish also protects the wood from elements and improves grip on the dowels. We also like that it contains all components needed, including the mid-court marks. Everything comes packed in a stylish reinforced bag with handles and drawstring, for easy storage and transport. A great alternative to the sets above, the Rally & Roar Kubb Game Set is another made to address the needs of most players. Whether you’re looking for a classic or tournament set, this brand proposes both, and at a price that won’t break the bank. Entertaining and interactive, this kubb game includes all you need to play straight out of the box, except the mid-court stakes. That’s not really a drawback though, as you can easily use any other stakes for this marking. A thing that we like is the quality build and materials. All pieces are made from heavy-duty pinewood; they are virtually chip-proof and indestructible even when you leave them outdoors in unfavorable weather. Making it perfect for beginners; this set also includes an instruction booklet; everything comes packed in a quality tote bag. And if you’re aiming for a little more color, the tournament variant can certainly do you justice. 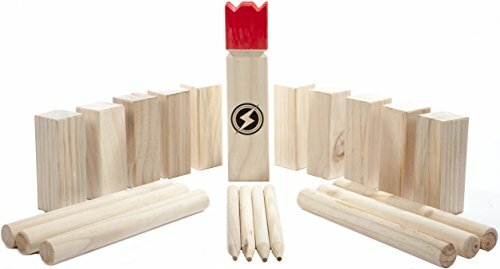 If you are looking for a cheap kubb set to enjoy this summer, the Striker Games Kubb Lawn Game could be the right one for you. Like all other sets on this list, the Striker comes with all you need to play right out of the box. The components are made from quality wood and come unpainted so that you can customize them if you want. The king though comes with a red crown and bares the brand’s logo on the chest. Both batons and kubbs resist wear and tear surprisingly well regardless of the surface you’re playing on. The game is designed to use on grass, gravel, sand, or snow, so you can enjoy a fun round regardless of the season. An instructions booklet is perfect for beginners, and everything comes packed in a stylish mesh bag. No doubt, a quality set to consider if you’re shopping on a budget. 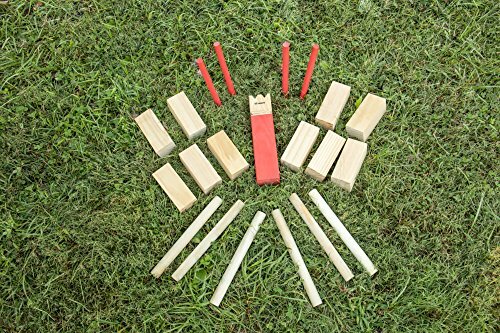 Kubb sets on the market may all look the same, but there are slight differences between them that an untrained eye could not spot right away. Since these differences can make or break the deal, here is how to pick the best kubb set for your family. Softwood: Perhaps the cheapest option, but also the more sensitive to wear and tear. Softwood will be damaged easily. This wood also has poor resistance to elements, so you won’t be able to leave it out in the rain. Hardwood: The best option you have but also the most expensive. Kubbs and batons made of hardwood will resist for years to come though and withstand weather and elements. If you don’t mind a heftier price, it’s the option we suggest. Rubber wood: Is a composite material consisting of mainly softwood reinforced with rubber. These kubbs have a higher resistance than softwood, and they can also be used indoors. Regardless of what material you decide to go for, make sure it’s eco-friendly and coming from a sustainable source. Besides the actual material, you should also check if the wood is treated with weather-resistant paint products and decide whether you want the pieces to have natural color or be painted in any other colors. According to the official rules, the size of the kubb court (or pitch) must be 8 x 5 meters. Lastly, consider the accessories your set comes with. These include the corner stakes, mid-court stakes, as well as rope to define the rectangle. Most kubb sets come with corner stakes, but very few come with mid-court stakes or rope. Another important accessory is the rules booklet, especially if you’re new to the game. Furthermore, check if the set comes with a carry bag. This accessory not only helps you keep the kubb set organized when not in use, but it also comes handy for transport purposes. Whether for leisure or profession, kubbs is a great game to play all summer long. It is perfect for kids and adults alike, and even if it’s not so popular as the horseshoes, it can really help youngsters learn strategy and improve their hand-eye coordination. Picking a set is also easy as long as you consider all things above. Moreover, you now even know which are some of your best picks so that you can leave all guesswork out of the game.